Survivor: Ghost Island (2018) - 17th place, 4th out. Voted out in Episode 4, "Trust Your Gut" (Day 12). Ghost Island Ep. 2 RC/IC: "Coming Up for Air" - Waits patiently to shoot baskets, takes one shot; Malolo loses again. Ghost Island Ep. 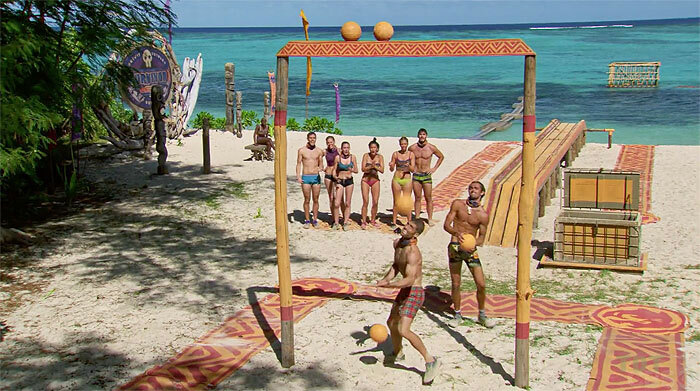 4 RC: "Water Slaughter" - With Michael, loses a point to Chris/Wendell; later, Malolo loses. Ghost Island Ep. 4 IC: "Cell Block Sea" - Helps move the crate & shoot balls, but... Malolo loses. Ghost Island Ep. 1 RC: "Chief's Choice" - Selects and directs the Malolo participants; Malolo wins (by forfeit). Ghost Island, Ep. 3: Present when Michael finds the Malolo (China) idol, Day 8. Ghost Island, Ep. 4: Five votes, from Bradley, Chelsea, Desiree, Kellyn, and Sebastian (voted out, 5-4). All Bradley does is complain! Erin Cebula at ET Canada (1/31/18): "Brendan Shapiro Brings His Athletic Background"
Josh Wigler at The Hollywood Reporter (2/5/18): "Meet Brendan Shapiro"
Dalton Ross at EW.com (2/16/18): "Meet Brendan Shapiro in 60 seconds"
Gordon Holmes at XfinityTV.com (2/20/18): "Brendan - 'Every Game We Play Is About Deception, So Why Do People Get Bent Out of Shape Here?'" Gordon Holmes at XfinityTV.com (3/15/18): "Brendan - 'It's a Game Built on Conflict, So I Thought There Would Be More Jerks'"
Dalton Ross at EW.com (3/15/18): "Brendan Shapiro says Kellyn accidentally revealed he was target"
Josh Wigler at The Hollywood Reporter (3/15/18): "Brendan Breaks Down Malolo's Big Move"
Mike Bloom at Parade.com (3/15/18): "Brendan Shapiro on Lions who Conspire, Lies that Transpire and Lines that Inspire"
Rob Cesternino at RHAP (3/15/18): "Latest Exit Interview - 3/15/18"
"Pet peeves: Passive-aggression, when people slow down to merge or change lanes, cry babies, and waiting. What's your personal claim to fame? I am not afraid to take risks and make big changes. During the recession, I left a well-paying but unsatisfying desk job, risking everything I owned, to start my own business. After more than a dozen years and at 40 years old, I sold the business to pursue another lifelong interest to become a teacher. Who or what is your inspiration in life? My wife because she overcame bike crashes, injuries, and big obstacles to become a world-class professional triathlete (while raising two kids and running a business). If you could have three things on the island, what would they be and why? A picture of my wife and kids to keep me tethered to reality, a football to throw on the beach, and bacon jerky because it's delicious and doesn't need to be refrigerated. Which Survivor contestant are you most like? Jeremy Collins and Tom Westman because I understand people and know how to unite them behind a common goal. Also, I am pretty athletic for an old guy. Why do you think you'll "survive" Survivor? I'm strong, fast, tough, and good with my hands. I can read a room. I know how to make people feel comfortable and secure. My tribemates will want to keep me around."